When Pius VI declared Baltimore as the first diocese in the United States in 1789, he also allowed, for one time only, the election of a Bishop by the priests of the new diocese. John Carroll was elected with a vote of 24 to 2. Carroll set about to build the first Catholic cathedral in the United States. Until the American revolution the Catholic Church was a persecuted minority and Carroll wanted the new building to express their new freedom in an American way and not of the traditional Gothic buildings of Europe. He chose Benjamin Henry Latrobe who was the finest architect in the country. Latrobe designed the capitol building and was a close friend of Thomas Jefferson. The chosen design was neo-classical, a style that was new and unique at the time and developed by Latrobe along with Jefferson. Work on the cathedral began in 1806 and moved slowly forward, but halted during the war of 1812. After the war work began again and the cathedral was completed in 1821. Using Greek components, Latrobe designed the portico with fluted columns that support a triangle pediment. The interior makes use of light and space with clear glass windows lining the north and south walls. The dome at the crossing has 24 skylights, each 10 feet long that allow light to pass through an opening in the inner dome and down into the rotunda. The result is a soft light seemingly coming from heaven. 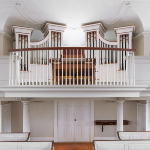 The first organ was built by Thomas Hall of New York City and installed in 1819. It had three manuals and included a 32’ stop on the Pedal. It was the largest organ built to that time. 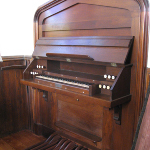 In 1884 Hilborne Roosevelt installed a new instrument behind the Hall case, possibly using some of Hall’s large Pedal stops. Roosevelt added wings to the Hall case. 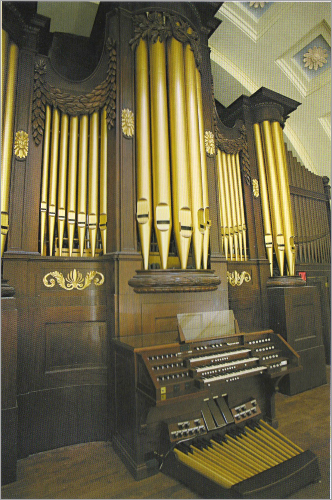 The organ had tracker action to vental windchests. In 1931, the firm of Lewis & Hitchcock electrified the Roosevelt and installed a detached console. 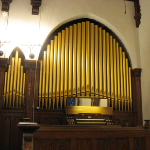 This lasted until 1989 when the Schantz Organ Company of Orrville, Ohio installed new slider windchests operated by electro-pneumatic action under the Roosevelt pipes with no tonal changes. The new console had a 30 note flat Pedalboard and solid-state circuitry. There had been many changes through years to the Cathedral that included adding stained glass and boarding up the deteriorating skylights. Green marble was laid on the floor, the chancel was enlarged and the walls painted grey. By the mid 1950’s the Basilica no longer met the needs of the diocese and a new, co-cathedral was built, Mary Our Queen, and the building badly needed structural work and restoration. The 32 million dollar restoration takes the Basilica back to Latrobe’s vision and the once dark interior again shines forth in the spirit of light. Andover was chosen to protect the organ and Team Leader Matthew Bellocchio, Al Hosman, David Zarges, Brian Harney and Casey Robertson removed the pipes and placed them into storage. 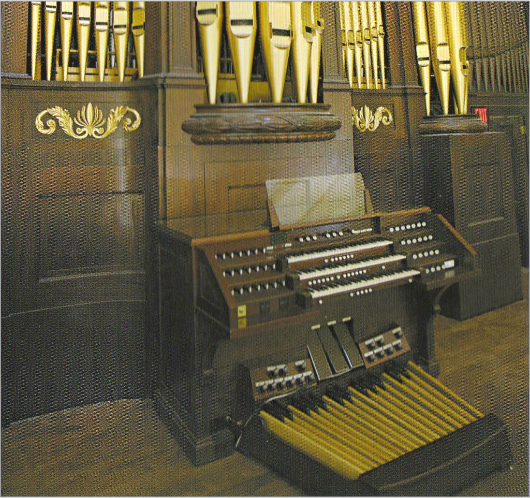 The console was brought to Lawrence where the electronics were upgraded and a 30 note concave-radiating Pedalboard installed and the console made moveable on casters. The organ case and windchests were covered and sealed. 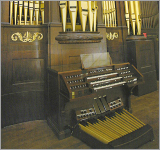 In June, a new blower was installed in the organ and pipes returned. There was much cleaning to be done. Tonal work remained until most of the work in the Basilica was completed, and Bob Reich and Jonathan Ross regulated and tuned the pipework, finishing just in time for the rededication ceremony on November 4, 2006. Andover is proud to have played a part in the fantastic restoration of the United States’ first Catholic Cathedral.